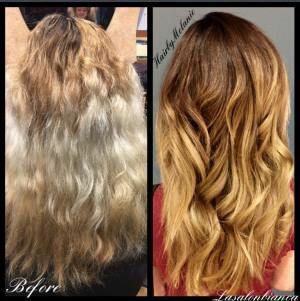 Melanie gave her client a complete transformation! Her hair was multiple different colors and very overprocessed. After doing a long layered haircut, she matched her clients natural color and used that for a base color for a low maintenance style. Then she glossed the ends with#SCHWARZKOPFPROFESSIONAL #IGORAVIBRANCE color. Her guest’s hair looked and felt so much better after!